Hormel Poly Lined Carafe, Swirl Design, 40oz Capacity, Black - Plastic carafe has the look of porcelain. Polyurethane foam insulation keeps beverages hot or cold for hours. Classic swirl design is elegant in any setting. Locking push button stopper allows you to press once to pour, press again to reseal. No need to unscrew to pour. Carafe will not spill when lid is closed. No need to hold down a lid with your thumb. The lid comes apart for easy cleaning. 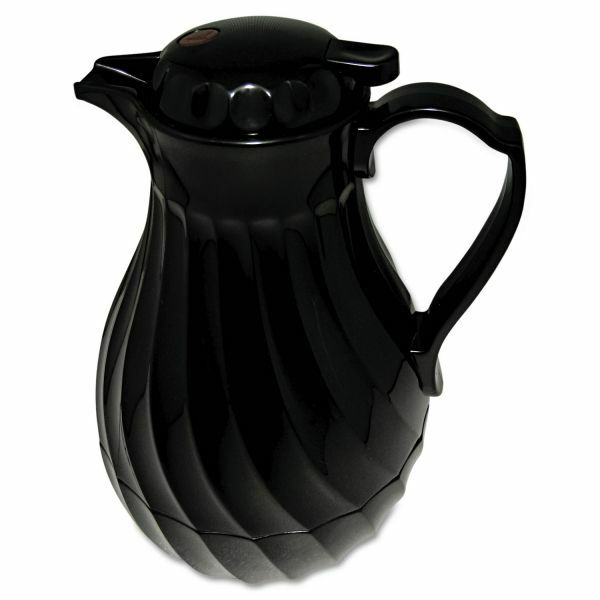 The ABS plastic gives the carafe a porcelain-like finish, while it remains durable and easy to clean. The polycarbonate inner liner is unbreakable, as well as odor-resistant and stain-resistant. All seams are ultrasonically sealed, ensuring that the product remains permanently intact. The lid is also insulated for better heat retention.